There is nothing pleasant about a yellow lawn or yellow spots on your turf. They not only look nasty, but a damaged grass lawn just doesn’t feel soft and healthy under your feet. 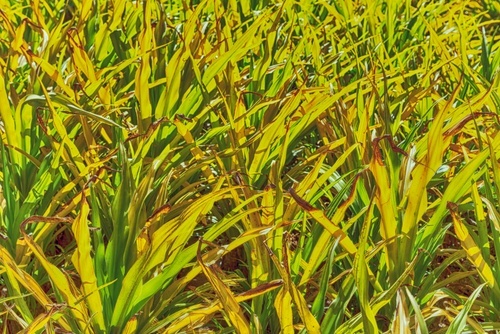 Your turf may turn yellow from deficiencies, diseases, pests, over-fertilizing, chemical damage, and pet urine. If you take action immediately when you notice your lawn yellowing, you can soon return it to health. Everyone wants to enjoy a lush grass lawn, and with a little prevention, mintenance and troubleshooting, you can have a beautiful carpet of turf around your home. Soil tests can help you determine if the yellowing of your lawn is due to a lack of iron or nitrogen. A good plant food or balanced fertilizer can remedy this problem. If you have an excess of weeds mixed in with your grass, the nutrients may be sucked away from your lawn. Taking action to make sure your lawn is getting enough sunshine and has good drainage can lessen damage from weeds. Living in a winter climate where salt is used to combat icy roads can cause damage and yellowing in your turf. In the spring, you should water heavily to flush away salt from the soil, rake away any dead grass, and re-seed bare or thin areas. If you are going to re-seed, make sure temperatures are above 35 degrees at night, soil is well-drained and warm, and that you’ve raked away any dead grass. Once you have determined which pest or pests are attacking your lawn, you can apply an insecticide that is specially formulated for that particular insect. When you are fertilizing your lawn, check to see if the spreader is calibrated to properly distribute the fertilizer. You may also have yellow lawn spots if you do not apply the fertilizer in the correct pattern. When you turn the spreader be careful so you do not over-apply fertilizer in the same area. If you use gasoline, salt, herbicides, oil, or any other chemicals near your lawn, make sure they aren’t getting into the turf. This is another situation that will turn your grass lawn yellow. Anyone with a pet, especially a dog, knows that urine creates yellow spots if you let them pee in the grass. The only way to prevent this problem is to train them to eliminate in a specific area that will not damage your yard. Some yellow spot damage to your grass lawn may look like it is caused by dog pee, but you should check for pests and deficiencies if you do not let your dog in those areas or have any dogs roaming the neighborhood. You may find all this information overwhelming and out of your area of expertise. If you need help with yellowing of your grass lawn in Wrentham, contact Distinctive Landscaping, Inc. Jason Scott, president of the company, holds many certifications and has over 20 years of experience in the industry.